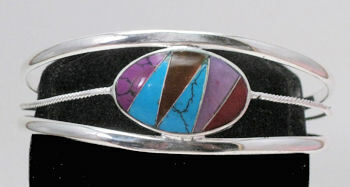 This german silver inlaid wire cuff bracelet has six semi-precious stones cut into an intricate inlaid triangle pattern in an oval setting. Measures 1" wide (2.5cm) at the widest point in front and tapers to 3/8" (1 cm) in back. About 2 5/8" (6.7 cm) measuring from side to side on the longest side. Adjustable by squeezing slowily in or out. One size fits all.